Bedrock Concrete LLC used a new Compact Equipment Attachment from Vacuworx to help overcome noise and vibration restrictions during a drilled pier installation project. The Olathe, Kan. contractor purchased a Vacuworx SS 2 Skid Steer Vacuum Lifting System to work on a Bobcat S650 Skid Steer to remove 46 squares of concrete that had been saw-cut into 4 ft. by 4 ft. pieces by a Husqvarna diesel concrete saw. The SS 2, outfitted with quick-connect hydraulic hoses, features a “universal” connection plate that allows for attachment to multiple skid-steer models. With a lift capacity of 2,716 lb, it is designed to lift any flat, non-porous material, including marble, granite, metal, steel or iron. 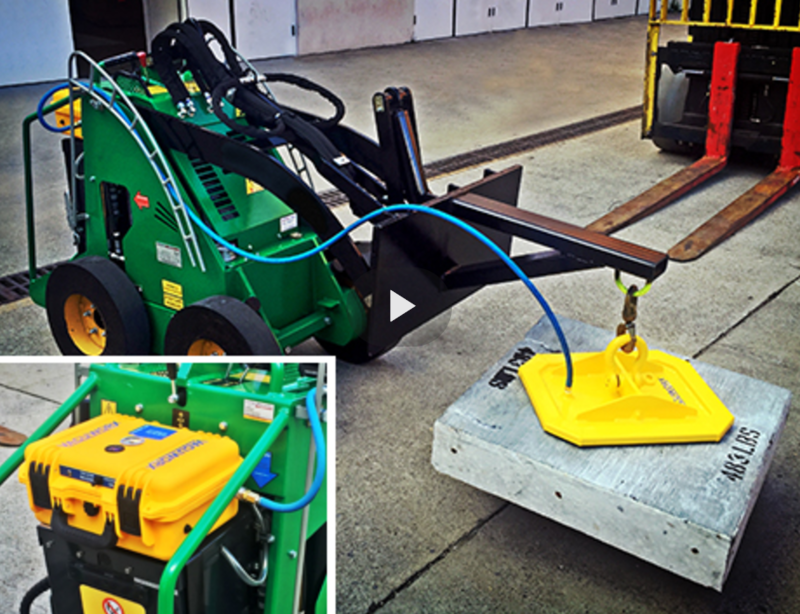 The vacuum lifting attachment is also compatible with mini-excavators for a variety of material-handling applications via a clevis hook connection. The SS 2’s hydraulically driven vacuum pump operates using the auxiliary hydraulics from the host machine. As opposed to using multiple attachments to break the concrete and then flip the squares out with forks, Bedrock co-owner Jon Rhoades said the SS 2 helped to create a safer and cleaner work environment that included reduced potential for disruption or damage to the subgrade. Bedrock, which installed an elevator pit and 46 concrete pillars in the building, also poured concrete to create two 50,000-square-foot floor plates as part of a second story addition in the former trade center exhibit hall.